Always a bit skeptical of products that claim to eradicate painful ingrowns, I admit I felt a touch of trepidation when opening Bliss Ingrown Eliminating Pads. A circular pad -- which looks much like Oxy's acne-removal pads from those awful 80's commercials -- that will really make sure I have no ingrowns or stubbly red bumps? You've gotta be kidding. But imagine my shock and surprise when I discovered that they actually work! After a recent bikini wax, this beauty chick religiously swept an alpha-and-beta hydroxy-soaked pad a day across the unmentionable area, right after stepping out of the shower. And believe me when I say I had not one ingrown or awful red bump as the hair began to grow back! Even better, there's no irritation caused from the pads, since they're formulated with green tea and oat extract for a soothing, calming feel. Don't believe me? Pick up a tub for yourself. Just think about how you'll feel if you don't try these the next time a part of you heads to Brazil. 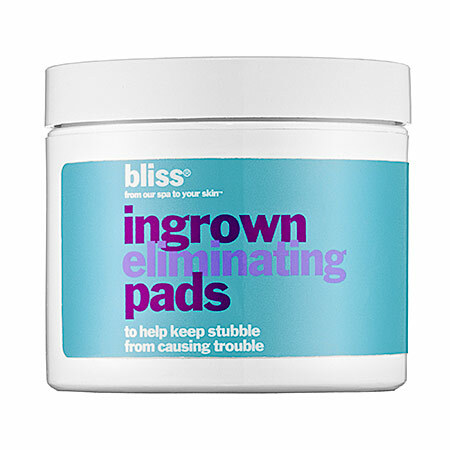 Bliss Ingrown Eliminating Pads are $38 for a tub of 50 at sephora.com.